Evolving Prime Time numbers for the Antena family of channels during January-July 2017 on all targets, respectively 18-49, urban and national, compared to the same period of last year. On the urban target, the Group’s TV stations led the market during Whole Day, Day Time, Access and Late Fringe, while on the national target they adjudicated the Day Time and Access intervals. 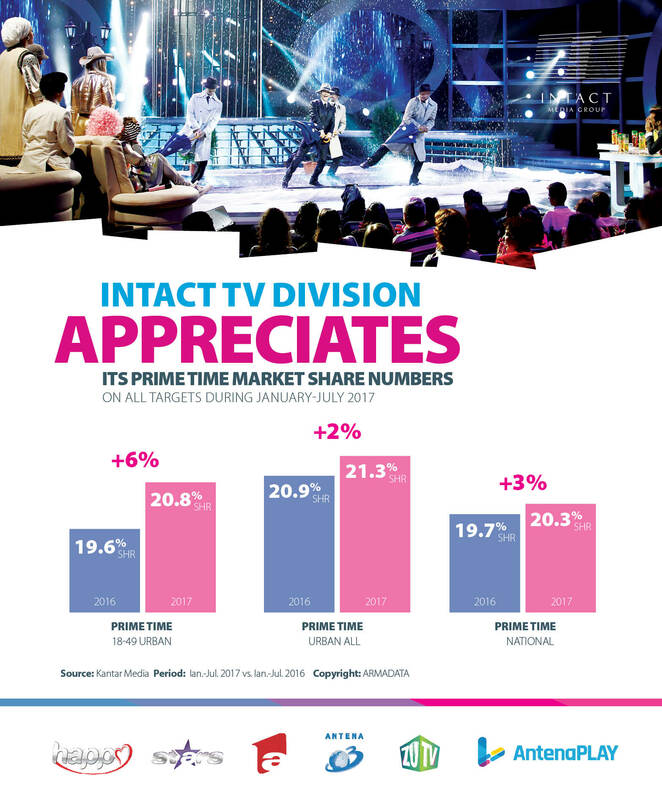 Between January-July 2017, the market share increased by 4% during Prime Time and 12% during Late Fringe, while audience numbers grew by 7% during Late Fringe on the 18-49 Urban target, compared to the same period of last year. Topping the audience charts in July, the reality Insula Iubirii (Temptation Island), the main news bulletin “Observator 19” and the magazine “Access Direct” proved their appeal to the public. 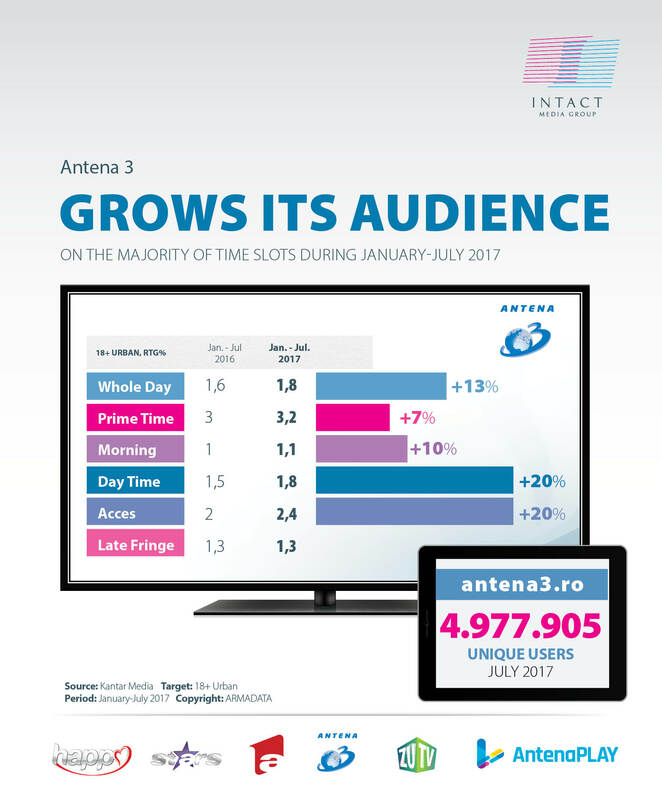 Antena 1 was watched in July, during Whole Day, for at least one minute, by 6.7 million Romanians, whilst www.A1.ro had more than 5.6 million unique users. 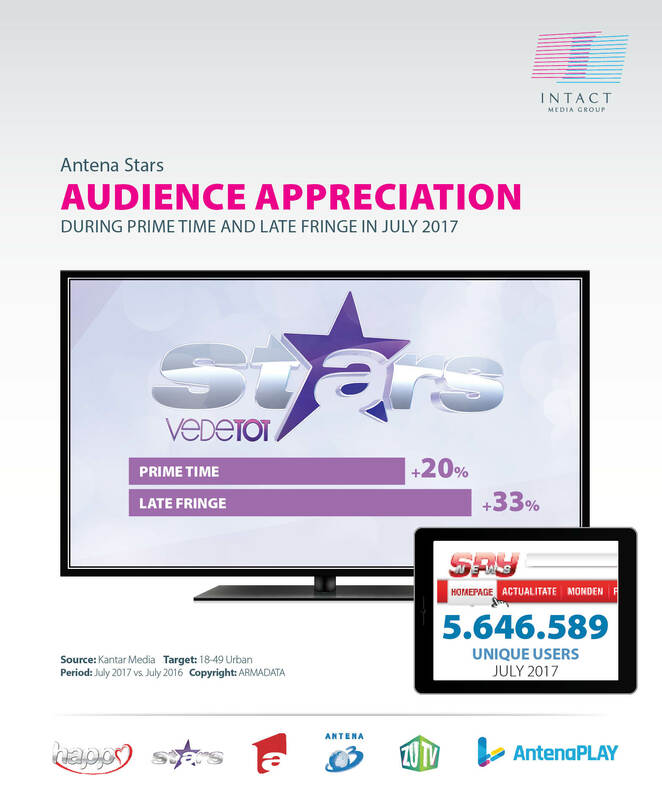 Antena Stars, the only TV channel dedicated to showbiz, had significant audience and market share growth during July. The station’s audience increased during Prime Time and Late Fringe by 20%, respectively 33%. The appreciation percent correspondent to the Late Fringe interval was similar during the January-July period. July marked the market share consolidation on the majority of time slots, amongst which prime time (11%) and whole day (5%). Over 2.8 million Romanians watched Antena Stars in July, during Whole Day, for at least one minute. The most popular productions were “Agenția VIP”, “Star la mare fitza”, “Rai da’ buni”. Happy Channel, the Group’s TV station addressed to daring women, appreciated its market share numbers by 8% during Prime Time during January-July, compared to the same period of last year (Target 18-49 Women, Urban population). The most popular series of the station included “Elif”, “Elita societatii” (High Society), “Tata de fetita“( Baby Daddy), “Sezonul cireșelor” (Season of cherry). Antena 3 led the news niche during morning and prime time in July, scoring at the same time audience and market share appreciation, compared to the same period of last year. As such, the audience appreciated by 17% during Day Time, and by 13% during Morning, while the market share increased on most of the time slots, on the Urban 18+ target. January-July 2017 saw audience and market share appreciation on the majority of time intervals, compared to the same period of 2016. In this context, the audience boosted by 7% during prime time and by 13% during whole day. Antena 3 was watched in July by more than 3.6 Romanians every day, on the National level. “Sinteza Zilei”, “ Voi cu Voicu”, “Adevăruri ascunse”, ”Exces de putere” were the most watched programs over the last month. On the digital front, Antena3.ro had more than 4.9 million unique users in July. Over 8.6 million Romanians watched Intact’s family of TV channels in July during Whole Day, for at least one minute, on national level, while 5.7 million were reached during Prime Time.